Sometimes your belly just calls for the simple things in life. The simply gorgeously, creamy and flavoursome things that is. Pasta alfredo is one of those dishes that you won’t see being made the same way twice; an ambassador of variation if you will. For me? I like a Penne with some very ‘non classic’ additions. Italians, forgive me. 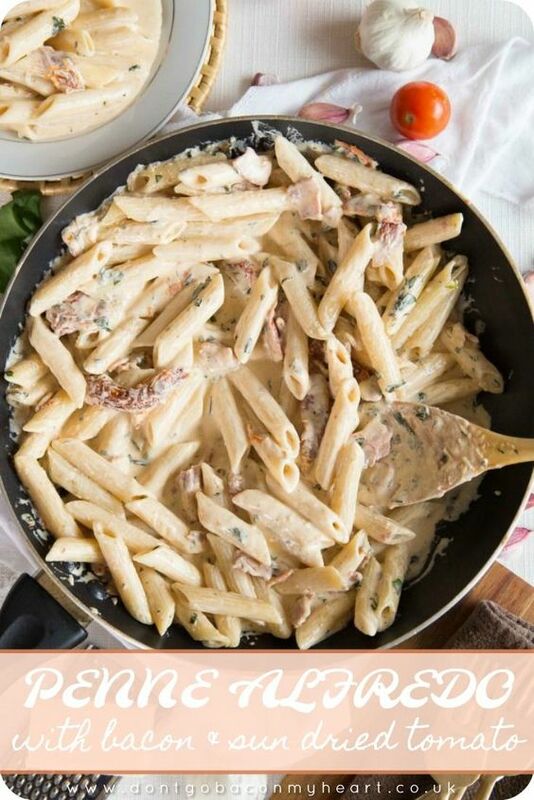 A delicious twist on the classic Alfredo. 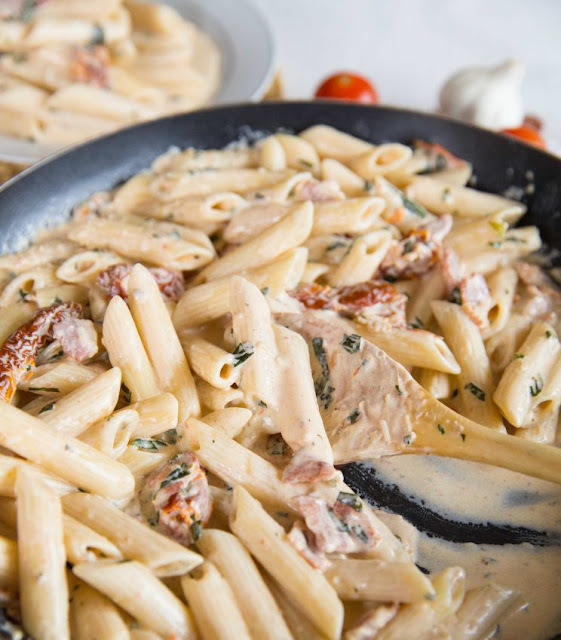 Penne Alfredo with Bacon and Sundried Tomato will change your 'go to' quick dinner forever. Pop your pasta in a pot of boiling water and cook until al dente. Retain a cup of starchy pasta water. Meanwhile, fry your Bacon over medium heat until it begins to crisp, then add your Tomatoes and fry a little longer until they soften. Drain excess fat/oil if there's too much, add the Garlic and fry for a minute until fragrant, then add the Butter and stir until melted. Pour in your Cream and sprinkle in your Basil. Stir to a smooth consistency, leaving to simmer on a low heat. When it just starts to thicken add in your Parmesan. Once the sauce has fully thickened (8-10 mins) taste for seasoning, then add in your pasta and toss until coated. Simmer for a few minutes to soak up the sauce, stirring throughout and using your pasta water to thin out if it becomes too thick and gloopy. Serve with and extra sprinkle of Parmesan and Basil! 0 Response to "Penne Alfredo with Bacon and Sundried Tomato"